Depa Billaba was a female Chalactan Jedi Master serving the Jedi Order during the final years of the Republic Classic era. Trained by Master of the Order Mace Windu and appointed to the Jedi High Council, Billaba was considered one of the most enlightened Jedi of her time and had earned her seat on the High Council. Having mastered the difficult Vaapad lightsaber form created by Mace Windu, she became one of its few practitioners and one of only three masters of the form. a. Two gold metallic balls or round discs affixed in the center of the face between the eyes and just above the eyebrows. b. Marks of illumination should be clearly made of metallic material and not approximated with makeup or body paint. a. Four looped braids should be placed symmetrically at the sides and back of the head. b. One non-looped or tightly-looped braid should run down the back of the head to the hairline. c.	Dark brown or black hair is suggested, but not required. a.	Neckline is a deep, closed V in front, with wedge-shaped collar panels. Collar panel is also visible at the neckline on the back of the robe. 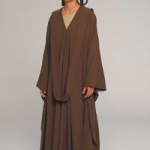 b.	Cloak does have shoulder seams, but may be constructed as wide, separated sleeves which hang down below the knee when arms are down, or as a poncho with open sides. Sleeves or poncho edges should at least cover the knuckles when the arms are down. c.	Robes should be at least floor length in front and back. d.	Robe should be fastened at the base of the neckline and over the chest, but should be able to open in the front from at least the mid-thigh down. e.	Front loop should extend down in the front to at least the mid-thigh. Width of loop should be proportional to the wearer’s shoulder. f.	Hood should be an extension of the loop, and should be at least three times the width of the loop in front. It should extend down below the backside when hanging freely. Separate hoods are also permitted, as long as they replicate the appearance of the continuous hood. Separate hoods may be open or closed in the back. a.	Neckline of tunic should fall straight across the chest or with a slight convex curve. b. Skirt of tunic should be full and fall at least to ankle. c.	Tunic may consist of separate shirt and skirt, provided that the border between the two is not visible and both appear to be of the same material. d.	Fabric should be a textured woven material, preferably with a diagonal ribbed pattern. a. Boots should made of smooth leather or leather-like material. b. Length should extend to ankle height or higher. High calf length is recommended but not required. c.	No ornamentation or visible zippers should be seen on the exterior of the boot from the ankle down, though interior zippers are permitted. a.	Robe may have a 6-12 inch train. While this feature is seen on the costume used on film, it is optional in this standard for safety reasons. e.	“Kanan” style hilt is recommended.